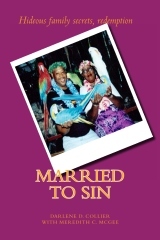 Darlene D. CollierJanice K Neal-VincentMarried to SinMeredith Coleman McGeeMississippi LinkMose Dantzler Pressmosedpress.comSexual assault hidden secrets revealed in book "Married to Sin"
Author William Trest, Jr. will join Darlene D. Collier and will read and sign copies of their books Feb. 17, 2014 from @ 1 PM – 3PM at the BOOK GALLERY 647 S Theobald St, Greenville, MS 38701. Later that day they will be guest on Off the Shelf Radio Program 91.9 WDSV Feb. 17, 2014 at 4 PM. The show is hosted by Radio Personality Lynette Stanford in the Delta Foundation Building, 819 Main St., Greenville, MS 662.335.5291. Collier will discu ss her tell-all memoir, Married to Sin, and Trest will answer questions about his novella, Reverse Guilty Plea which is about a fierce family feud.